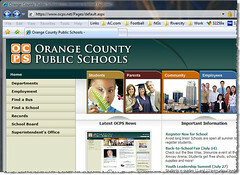 The Orange County Public Schools system, which is essentially the Orlando, FL school district, just revamped their site with a MOSS 2007 Web Content Management implementation. I have to say, it looks great! Sure there have been other sites that don't look like SharePoint out there, but it's very cool to see one in your backyard that you were somewhat involved with. A while back I did some work with their production team in getting ramped up on the SharePoint platform, specifically MOSS 2007 WCM. Over the months we traded emails working through some issues they encountered as well as a few bugs they ran into, but all in all, the final product came out the other end of the production line as a great product. I've got to hand it to JohnR and RandyD, two guys on the production staff of this project for their company, who did a fantastic job on the site. Check their blogs for a more detailed discussion on how they did it.